This is open to the public, come join us at the old Fox and Hound! If you're in town on Labor Day weekend, Please plan to join us at the old Fox and Hound Foothills Mall (now remodeled into Craft Republic) location for another fundraiser for Cystic Fibrosis! Proceeds will help the new Teen SALT (Students Allowing Lungs to Thrive) Board with Cystic Fibrosis Foundation to buy gifts for children in the hospital during the holidays. Cost is $30, with 50% going back to CFF. 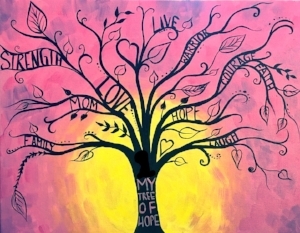 "The Tree Of Hope" painting can be customized to display your own Hopes and dreams.